Constructor Plus, the long-awaited sequel to Constructor HD, the 'wittiest building and corruption simulator of this century and the last' hits the Nintendo Switch  soon! Build your power base here on Earth then reach for the stars. 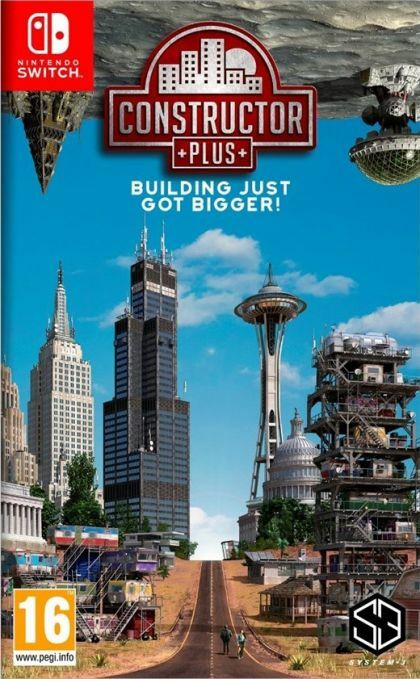 Constructor Plus will take you out of this World! There are MANY new buildings and building options. Constructor HD had 43 buildings you could build. Constructor Plus has 139! Constructor HD had 5 worlds to play in. Constructor Plus now has 17, including the stunning new Outer Space Worlds. The game now has 65 new levels of 'PLAY' options, which are pre-built cities for you to expand and work on. These 65 pre-built cities are across the range of world maps. You also have a Mission Mode. This is a story mode you work through in addition to your 65 pre-built city levels. These again are pre-built cities with a story line to work through with a number of challenges and puzzles to overcome. There are 15 different stories (missions) to play through. In addition to 'Play' and 'Mission' modes, we have kept in the original 'Classic Constructor'. This time we have updated the game set up screens and game objectives to make it more intuitive. Constructor Plus also sees the introduction of Retail Units, Casino's, National Monuments & Steptoe's Yard (a great new 'Undesirable' feature).